One of the parents I work with asked me to come up with some tools to help her child who struggles with increasing anxiety in the face of difficult homework or tasks that have a lot of steps like essays or projects. I understand anxiety well; it’s something I struggle with as well. I thought about what I’ve learned about anxiety as well as what has worked for me, and last week I presented her child with this list. The student typed it up with some flourishes and I thought it was so great I had to share it with you. I especially appreciate the addition of the pegasus. Everything is better when it includes a pegasus. 1. Notice the panic is happening. 2. Get up from what you’re doing and walk away. 4. Calm down and relax. 5. Only bite off as much as you can chew. 6. Be okay with getting stuck. If you are still stuck, go on to the next thing. 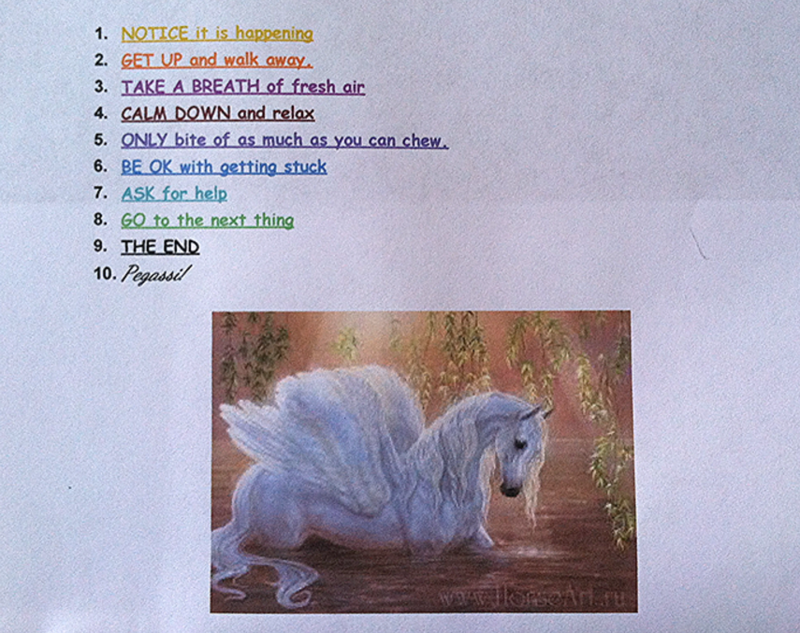 Next time your child starts freaking out about a school assignment, try the steps on the list. And let me know how it goes!